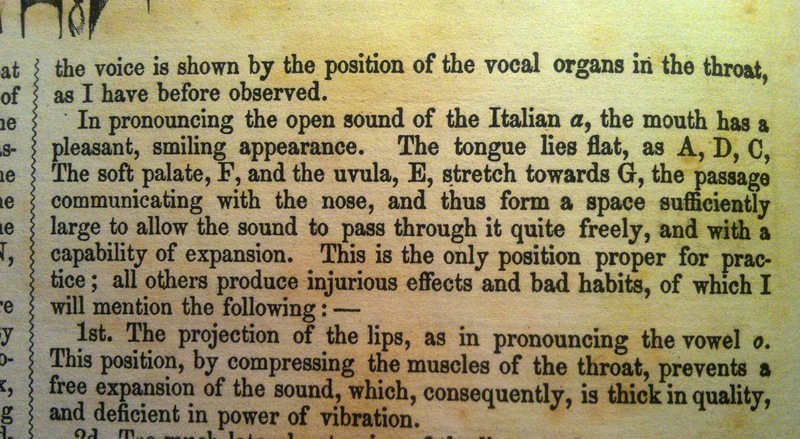 These are the words of the great basso, Luigi Lablache, who I wrote about some time ago in a post which contained a fascinating page from his Method of Singing, which I reintroduce to the reader in three distinct images, his method being notable for containing what may be the first representation of the tongue and its articulation for /a/ in a singing manual. 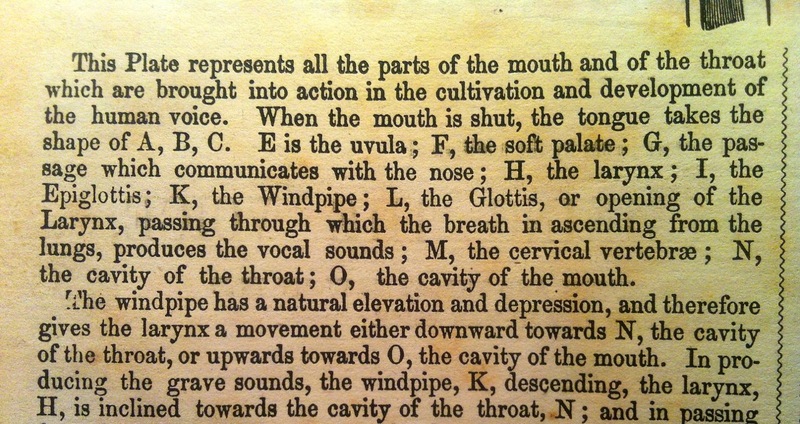 If the reader looks closely at Lablache's graphic of the tongue and reads the accompanying text in this post, it becomes clear that the tongue, when articulating an Italianate /a/, lies lower in the mouth when it is open than it does when it is shut—a simple enough idea for those who can hear and feel what this means. The García School also taught that the tongue must be flat for /a/, which is clearly demonstrated in A Complete Treatise on the Art of Singing and Hidden In Plain Sight: The Hermann Klein Phono Vocal Method Based Upon The Famous School Of Manuel Garcia. And if this isn't enough, I could point out half a dozen Old Italian School singing manuals which contain this same teaching, but I think you get the picture: It's ubiquitous. However, the major problem for the English speaking student is that a flat tongue /a/ is going to sound either guttural or nasal in timbre. As a consequence, the acquisition of an Italianate /a/ is fraught with difficulty. I haven't had an English speaking student who did not need to work on /a/ and the tongue's formation in the mouth, and believe my colleagues have experienced the same thing. Mind you, I don't tell students to flatten their tongues as a goal if only because experience has shown me that appearances can be deceiving. Like icebergs, which can look perfectly harmless, the inexpert articulation of the unseen mass beneath the surface of the tongue can wreak havoc. What to do? Both singer and ship have to investigate what cannot be seen. This is done through feeling, and more importantly, the clear expression of vowels. At this juncture my mind goes sideways and recalls the teaching of a Madam Alberti, who I stumbled upon a while ago. The ancients employed the full capacity of the lungs, the full length of the tongue, the full length of the vocal cords on every note uttered whether high of low, loud or soft. I've kept Madam Alberti's words in mind ever since I found them, if only because they point out the difference between what is seen and felt. That's the thing really. 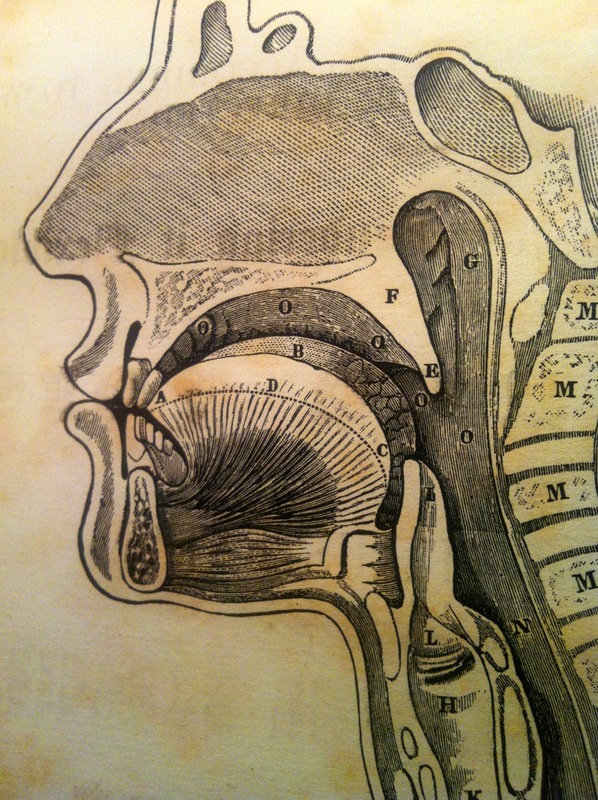 Those with heightened proprioception know that the tongue can feel one way and look another, which explains why it is possible to associate movements of the tongue with sounds other than /a/ itself. My own teacher took a somewhat different view by suggesting that the tongue should feel like a sweater that has been folded up and put in a drawer—soft, yet active—a novel approach that combines feeling with movement. Of course, all this tongue talk can leave one feeling like Demosthenes, who practiced with marbles in his mouth, which points out that those learning Lablache's method would do well to note his requirement for opening the mouth, which should have a "pleasant, smiling appearance." To be sure, one can "smile," but if the eyes are not smiling, something less than pleasant will happen. Why is /a/ so important in the Old Italian School? Because it was considered the basis for singing. Experience has shown me that the formation of the tongue on /a/ changes when the student's ear has been opened, which entails a subtle yet powerful shift in awareness. Note: January 20, 2016: Subsequent research on this plate reveals that it also appeared in the c. 1860 Oliver Ditson edition/translation of Domenico Crivelli's "Art of Singing" which was first published in 1820—the plate in Crivelli's earlier text appearing in a somewhat different form. Oliver Ditson added this plate and a few exercises to the c. 1860 edition/translation. Many thanks to Mattia Pelli for locating the source of this addition to Lablache's text.